The Palace boss admitted his side were unable to contain the Reds, despite fuming at the non-awarding of three penalties for his side. 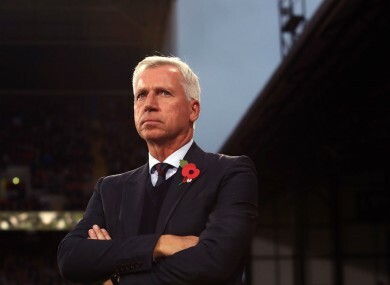 Crystal Palace manager Alan Pardew. CRYSTAL PALACE MANAGER Alan Pardew blasted the decision to appoint Andre Marriner as referee for his side’s clash with Liverpool after seeing three penalty appeals denied in the 4-2 defeat. Goals from Emre Can, Dejan lovren, Joel Matip and Roberto Firmino were enough to keep Liverpool in the title hunt alongside Manchester City and Arsenal, but Palace regularly found gaps in their defence. James McArthur twice pounced on sloppy defending from Lovren to score Palace’s goals, while Wilfried Zaha and ex-Liverpool striker Christian Benteke were felled in the danger area by Can and Matip in a second half that Palace had the better of. Marriner awarded Liverpool a contentious stoppage-time penalty in this fixture last season, scored by Benteke in a 2-1 Reds win, and Pardew says the decision to send the official back to Selhurst Park was a poor one. “It was too open at times for us and we gifted possession too much to Liverpool, particularly in the first half,” he told BT Sport. “The second half was a little better. “But there were still some decisions that went against us. “I don’t think Andre Marriner should have reffed this game. After the penalty he gave last year… we’ve got a negative in our mind anyway. Why was (head of the Professional Game Match Officials’ Board) Mike Riley giving him the game today? I can’t understand it and then we get three penalty calls, OK they’re tight, but they’re probably no worse than Christian’s last year so it’s just a little bit frustrating. “Having said that, Liverpool are a bloody good team and we found it difficult at times. Email “'Why was Mike Riley giving him the game?' - Pardew slams referee appointment after Liverpool loss”. Feedback on “'Why was Mike Riley giving him the game?' - Pardew slams referee appointment after Liverpool loss”.